The banner you see above is found at the top of each listing on our site. The fastest way to tour a listing you like is by clicking on the banner at the top of each listing page. Once you click it, a “REQUEST A VIEWING” box will appear on the screen. 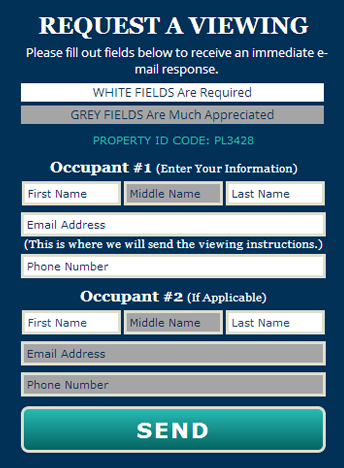 Fill out the fields in the “REQUEST A VIEWING” box, and be sure to type in your information accurately. When finished, click the “SEND” button and you will immediately receive an e-mail response from us with simple viewing instructions. Following the steps above is by far the fastest way to tour a property you like. Please follow the above steps for every vacancy you want to tour. Thank you. If you are a renter searching for an apartment, the phone # and e-mail address listed above are your primary points of contact with our staff. Members of our staff are fielding phone calls and responding to e-mails 7 days each week. We market hundreds of properties, and therefore received a very high volume of interest each day, but we will always do our very best to answer your calls and e-mails quickly. If we cannot make it to your call, please leave a complete voicemail for us, and we will be sure to call you back as soon as we possibly can. If you are interested in applying to rent one of our vacancies, the phone # and e-mail address listed above are your primary points of contact with our application staff. This line is dedicated for tenants that have completed their apartment search, and want to apply to rent. If you are a property owner interested in working with us or want to learn more about our service, this is the # for you to call. These calls are answered by members of our business development staff. Give us a call today so we can discuss a partnership. If you are a current Pacific Listings client, this is the best phone # for you to call. You can call this line if you have a new vacancy for us to shoot, if you have questions about an application, if you have questions about billing, or for any other reason. Our staff will make sure your call is directed to the appropriate person on our team.